Native to Mexico, Slipper Flower is a small and showy annual with divided leaves and spikes of puffy, pale yellow flowers. Stems are erect or lax, usually not branched, dark reddish, up to about 25 cm tall, glandular-hairy and sticky in upper part. Leaves are stalked, usually pinnate or ternate, sometimes simple. Blade with large end lobe up to 3.5 cm long, lanceshaped to ovate, hairy or glandular-hairy, sawtoothed; base often with 1-4 small irregular lobes or pinnae. Bracts are similar to leaves. Flowers are stalked, few in branch-end cymes. Calyx is 6–8 mm long, deeply lobed, strongly veined; lobes ovate, usually sawtoothed, glandular-fringed with hairs. 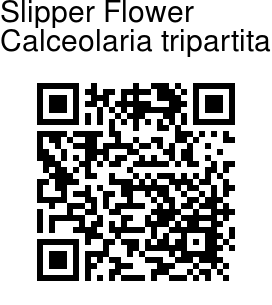 Flowers are golden yellow; lower lip 1.0-1.5 mm long, nearly round; upper lip 3-4 mm long. Stamen connective 1-1.2 mm long, Capsules are 6-9 mm long, ovoid. 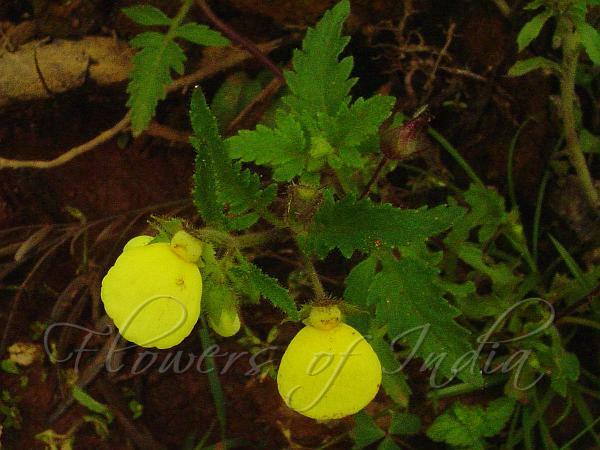 This plant has escaped cultivation in many area in India, and can be seen growing wild, even in the Himalayan region. Flowering: April-December. Identification credit: J.M. Garg Photographed in Munnar, Kerala & Sikkim.